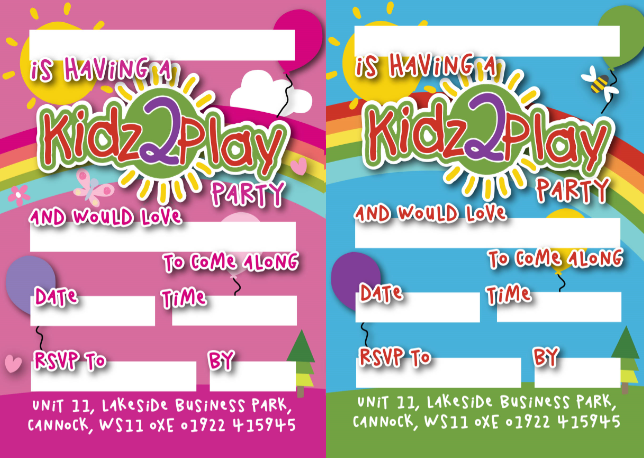 Kidz2Play Party Invitations are now available to download!! 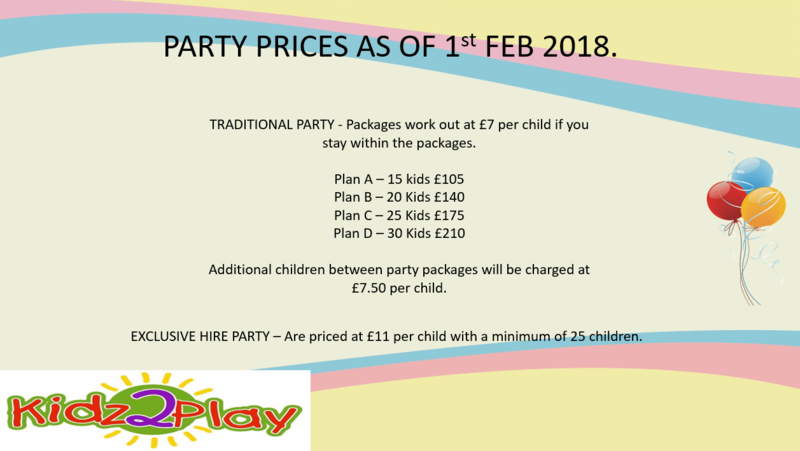 Kidz2play traditional party prices will be held at current prices until the 31/01/2018. From the 01/02/2018 please see the new prices detailed below. 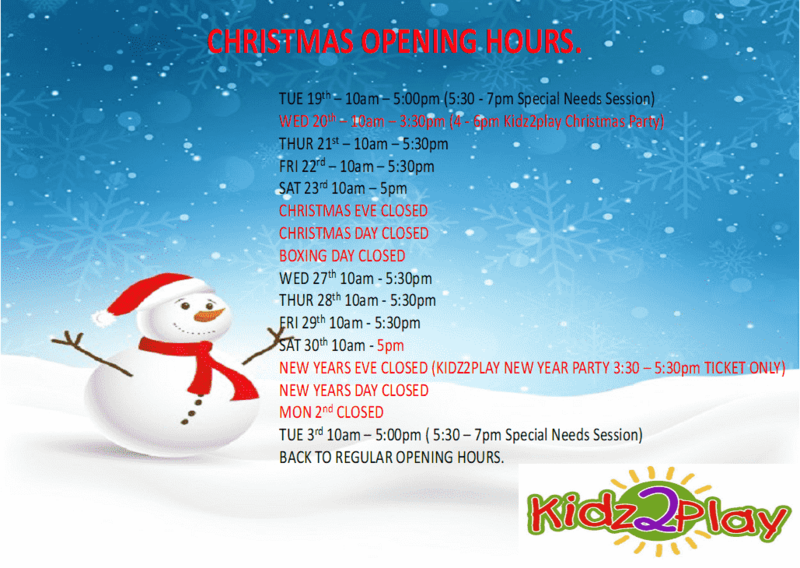 Kidz2Play Christmas and New Year Parties - Get your Tickets now!! 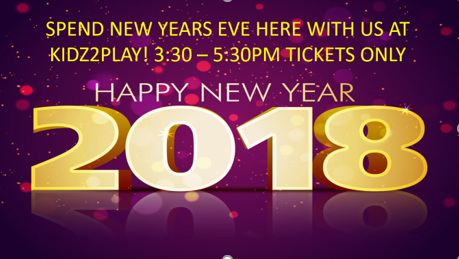 NEW YEARS EVE PARTY 2018 3:30 – 5:30pm. 1hrs play on our 3 tier play frame. Followed by a buffet for the children. Once the children have finished eating our Party Hosts will entertain the kids with party games and dancing. Whilst the children take part in the activities, there will be complementary Bucks Fizz and Mulled Wine as well as festive snack for the adults. Let us tire the kids out so that you may relax and enjoy the New Year Bells!!! Our New Year Party will be a ticketed event and the price is only £12 per child. 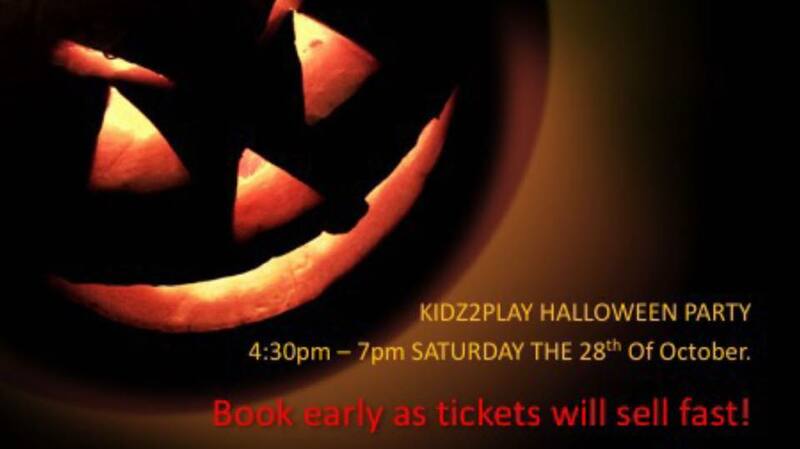 Please speak to our staff to book your tickets. We have had great feedback for our proposed special needs session, so much so that we have had to have a bit of a re think on when to run the session to make it more of a permanent fixture. Initially we had pencilled in a Monday for the session but with the interest that this session has generated we wouldn’t want to have to cancel any sessions so that the centre could carry out our routine maintenance work. So therefore, we will initially start the sessions once a week on a TUESDAY between the hours of 1730 and 1900 at a cost of £4 per child. We want the session to be of maximum benefit to you and your children so we will limit the session to a maximum of 50 Kids. To avoid disappointment as some people may be traveling a fair distance to attend, this will be managed by a booking sheet. Our first session will take place on TUESDAY the 29th of August, and we will be taking bookings by phone call only as of 10:30am on the 14th of August. (We would like to say book via our Website or Facebook page but this is not manned 24/7, so to avoid confusion we have decided booking by phone will be the easiest way to guarantee a slot). If the session proves to be a success and there is demand for it, we will look to run another session on a Thursday. We look forward to welcoming you all to the centre very soon, as with all our sessions the staff are there to assist wherever we can but Kidz2play would like to remind all parents that when using the centre the parents are responsible for supervising their own children at all times. Children with disabilities whether they be physical or mental face a number of barriers when taking part in leisure activities, as a result they often take part in fewer activities. Kidz2play are considering launching a private play session for children with disabilities or learning, behavioural, social, physical or mental skills issues. We know that Children like their comfort zone, so why not bring a friend brother or sister along too? Moms dads and carers get to chill out too with like minded people in a safe and secure environment. We are looking to start a session on a Monday between the hours of 1700 - 1830. 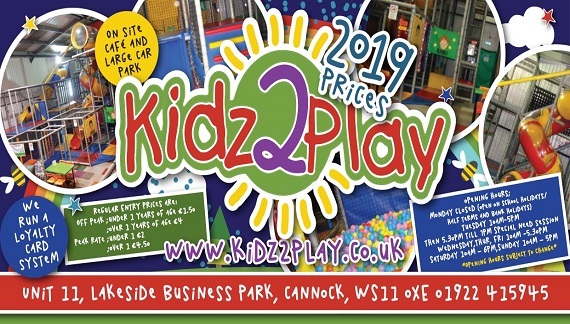 Please register your interest by either emailing us at enquiries@kidz2play.co.uk, sending us a message via the contact us page on our website or calling us on 01922 415945. 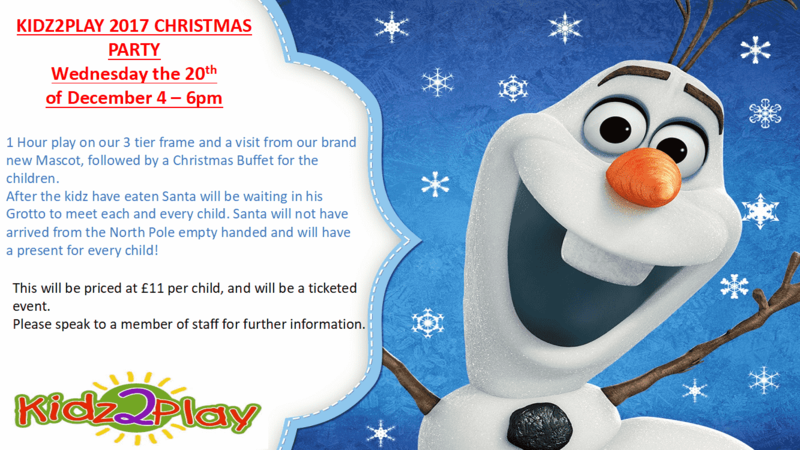 Kidz2play sign up with Slush Puppie !!! Fabulous playcentre, softplay & playframe, cafe area, all under one roof, come just to play or let us hold your child's party. Slush Puppie has now arrived !! 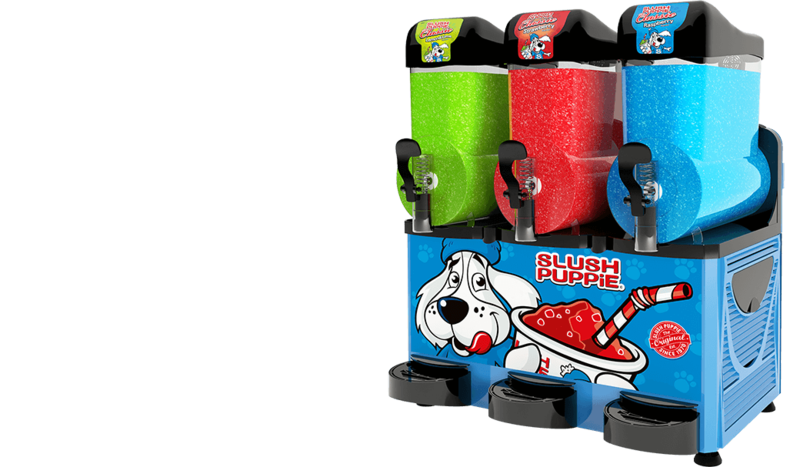 Slush Puppie Coming Soon ! !